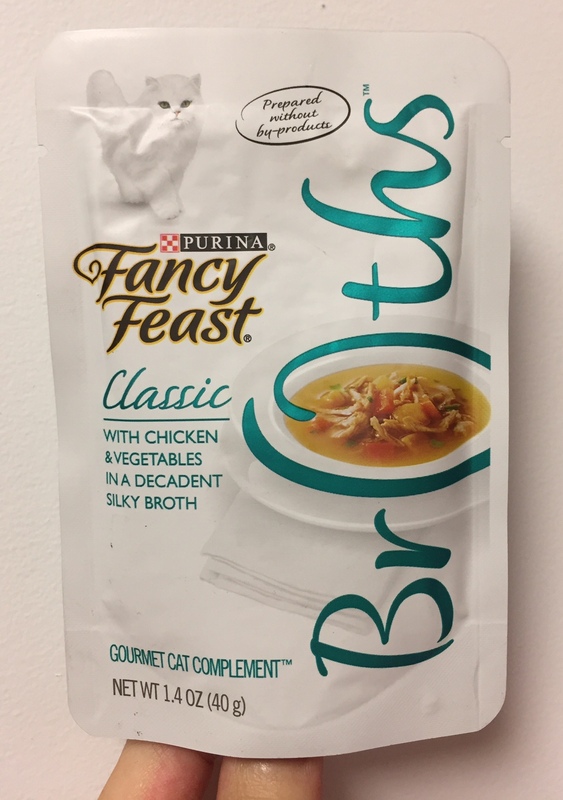 We gave our cat Fancy Feast Broths Classic: With Chicken & Vegetables In A Decadent Silky Broth. As it's Classic, the broth was clear like bouillon and light brown while Creamy looked like clam chowder. There're carrots and spinach, the latter of which I first thought parsley. He's away when we're opening the pouch in the kitchen, but he heard and smelled the sound and came to the kitchen screaming. 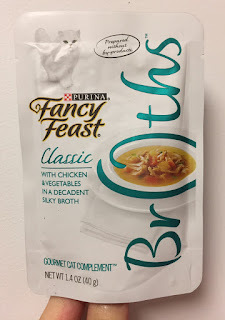 He sure was excited, but to me, Fancy Feast Broths Creamy: With Tuna, Chicken & Whitefish seemed to have made him happier. He immediately started eating and drinking the soup. He somehow starts with soup and then later, he eats the chunks, not the other way. He spontaneously picked up the pieces that fell on the floor from his mouth. He licked the bowl so well that the bottom looked shiny. I gathered leftover pieces, and he's eating from my fingers. We're a bit surprised to see him enjoying land meat while he didn't seem to love Fancy Feast Kitten Turkey that much.